What if we had listened to the Inflation Hawks? Recently, the Trump Administration nominated for appointment to the Federal Reserve Board of Governors economist Marvin Goodfriend, who encountered well rounded opposition to his nomination. Among potential criticisms include the familiar critique against some conservative economists since the financial crisis - that their fears about a significant rise of post-crisis inflation were overblown and that their higher interest rate policy prescriptions would have been unduly harmful in the face of a tenuous recovery. Given that inflation has remained subdued during the post-crisis period, many, including Goodfriend, now recognize that raising interest rates in this period would not have been optimal. But what would the US economy have looked like if the "inflation hawks" ran the show? Are democrats' concerns regarding potential employment effects well founded? Partly for pedagogical teaching purposes and partly just for pure fun, here I utilize Federal Reserve data in order to illustrate the potential alternative effects of a higher interest rate path, emphasizing the impact of a higher federal funds rate on aggregate employment. The results are cautionary and illustrative. To highlight the distinct paths of the inflation "hawks" vs the "doves", I draw upon Taylor Rule prescriptions for interest rate policy over the period. Given a particular policy rule as discussed in a Fed blog post, a Taylor Rule interest rate which approximates an inflation hawkish view would have substantially increased the federal funds rate as soon as 2010, and it is this subsequent period which allows for a clearer delineation of the different paths of monetary policy. I follow a basic setup similar to Bernanke & Blinder (1992) in their demonstration of the "credit channel" of monetary policy transmission. I use a Vector Auto Regression (VAR) model with a basic set of measures - the unemployment rate, the federal funds rate (the target policy rate of the FED), real GDP, PCE Inflation, and total US banking assets. I first estimate the VAR restricted to the last quarter prior to the financial crisis (2nd Quarter of 2008), and then forecast the the unemployment rate over the period from 2010 onward (when "hawk vs dove" interest rates diverge) using a one-step ahead forecasting method. 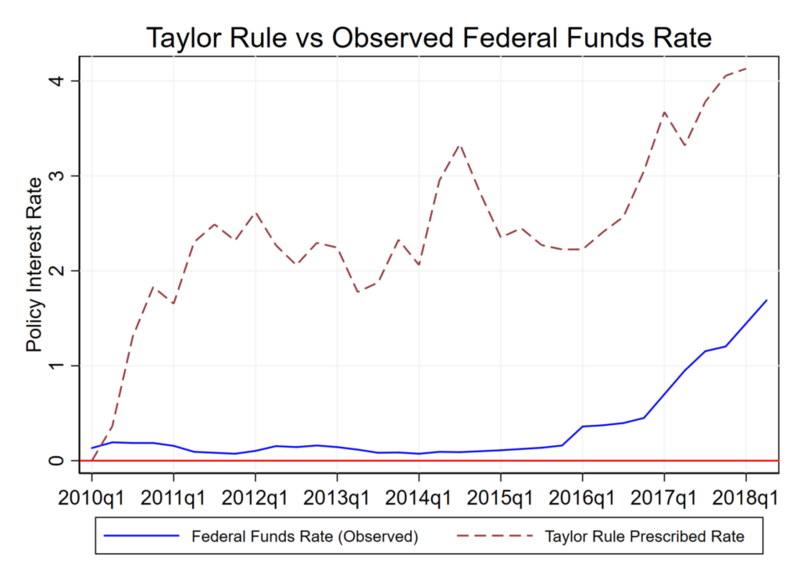 I then repeat this forecasting procedure, but instead change the forecast to assume that the federal funds rate in fact followed the path prescribed by the [below] Taylor Rule. 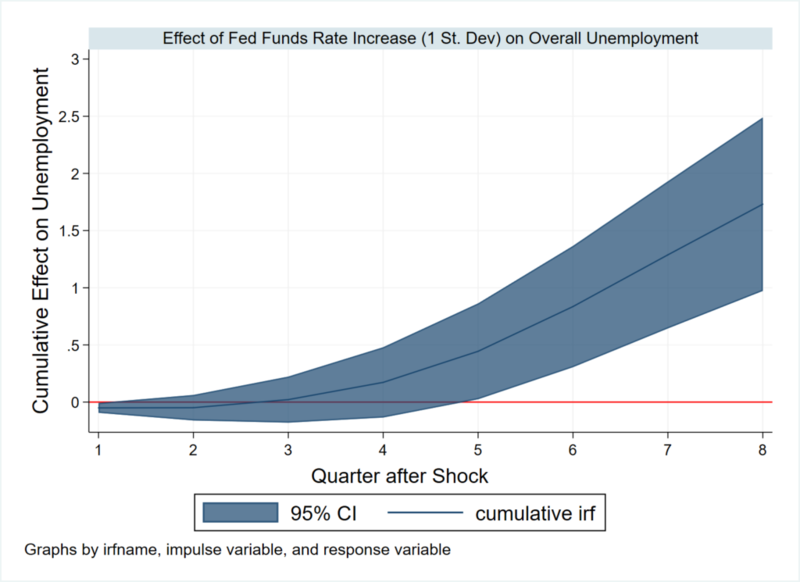 In so doing, I first obtain estimates of the influence of a shock to the federal funds rate on the level of unemployment. I then am able to simulate the effects of a higher interest rate path over the remaining period based on actual data held out of the regression sample. In this way, I illustrate the counterfactual policy path. 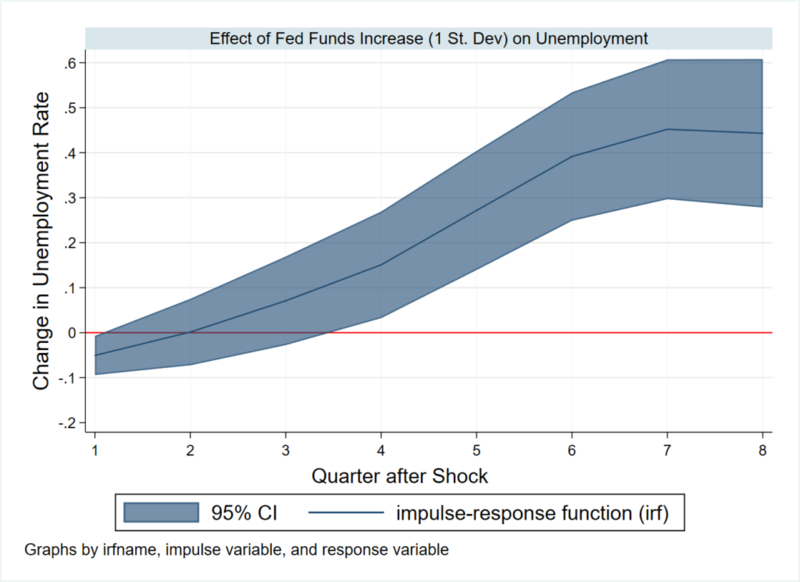 In this first figure, based on the VAR using quarterly data restricted from 1973 to 2008, I show the Impulse Response Function of a one-standard deviation shock (~3.6%) to the federal funds rate on the level of unemployment. The IRF traces out the impact of an interest rate shock over future values of the unemployment rate, allowing a visualization of the lagged impact of monetary transmission. The shaded region indicates the estimated error variance (95% confidence intervals) around the mean prediction. In this figure we see that a shock to the federal funds rate predicts an increase in the level of unemployment significantly at 4 quarters subsequent to the increase. The predicted impact of interest rates peaks at 7 quarters after the shock, leading to a higher unemployment rate of 0.4%. It is noteworthy that the magnitude of this predicted unemployment impact is actually quite similar to Bernanke & Blinder (1992), who demonstrated the impact out to approximately 4 quarters with an unemployment rate change of slightly less than 0.2%. Such interest rate changes may seem small to some, but it is important to remember the cumulative impact that this has over time. To illustrate this, in the next figure (2) I show the cumulative IRF, which shows the cumulative impact of an interest rate increase on unemployment over time. Here we clearly see the magnitude of the impact over time, as it shows that out to roughly a two year horizon interest rate shocks worsen unemployment by about 1.75%. The results thus illustrate what conventional monetary theory tells us - that increased interest rates increase the cost of lending and that this may curtail business expansions and labor markets. Above, we see the divergence of interest rates between the hawkish view (the dashed maroon line) and the dovish view (the blue line, indicating zero interest rate policy based on historical experience). I have shown the potential impact of interest rates on the level of unemployment, and the negative effects seem to validate the approach of the doves, given generally low inflation over this period and persistently low inflation expectations (per TIPS securities). It highlights the costs and distributional impacts of different monetary policy preferences and shows why in the US case democrats may be concerned with interest rates which are too high. But above I cut the data prior to the financial crisis - now, it would be useful to simulate these results over the post-crisis period. As a disclaimer, there may of course be other dynamics at play in the post-2010 world. The Feds heavy balance sheet and the binding zero lower bound suggest that typical macro dynamics may be operating differently in this period, and it is questionable whether I have successfully captured these influences. Regardless, it may be an illustrative exercise. In the last figure below, I show the counterfactual policy path - what impact interest rates would have had if monetary policy had followed the hawkish path. 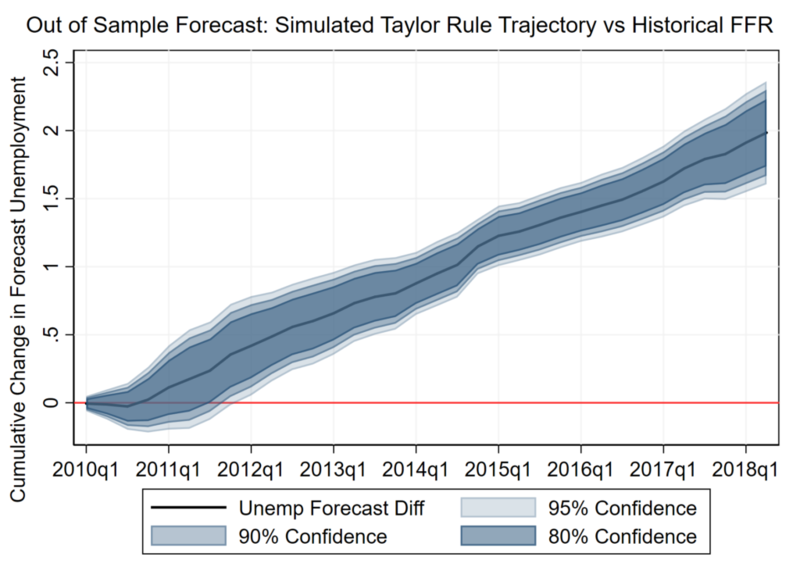 Specifically, using the economic data from the held out post-2010 sample, I simulate the impact of hawkish interest rates by taking the difference of the predicted interest rates from the taylor rule path from the predictions using actual historical interest rates. Thus, I predicted unemployment rates using historical data (the blue line in Figure 3) in addition to rates predicted from fake Taylor Rule data, holding all other economic data constant. I then summed the difference between these predictions over the remaining historical period, to show the cumulative effect of these interest rate changes. Here, we find that while an initial change in interest rates does not immediately impact the unemployment rate, over time following a taylor rule policy path in the aftermath of the crisis would have significantly worsened the unemployment rate, though the impact is a bit less than that predicted from the IRF. At a 2 year horizon, unemployment is predicted to be roughly 0.4% higher, and at 4 years unemployment is predicted to be roughly 0.8% higher. Ben Bernanke has had many critics during his tenure, especially based on the grounds that monetary policy had been too loose and that the country would be devastated by rampant inflation in ensuing years. Yet, inflation expectations remained well anchored. Other conservatives also complained about the sluggishness of the post-crisis recovery. Yet policy prescriptions advocating for a much more restrictive monetary policy would have quite clearly, it seems, only led to increased unemployment with no meaningful benefit to inflation outcomes. At least, years later, it seems few would challenge Bernanke on the prudence of policy during his tenure.